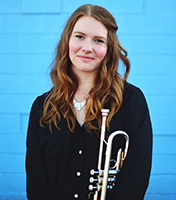 Brianne Borden currently attends Arizona State University for her Doctorate of Musical Arts in Trumpet Performance where she served as Teaching Assistant from 2016-2018. Enthusiastic about management and leadership, Brianne serves as Personnel Director to the Phoenix Brass Collective, a local symphonic brass ensemble. Brianne‘s alma maters include the University of Colorado - Boulder for her Master’s, where she taught as a TA and performed with the Graduate Brass Quintet, and SUNY Potsdam for her Bachelor’s. Her principal teachers include David Hickman, Dr. John Ellis, Terry Sawchuk, and Justin Bartels. Throughout the years, Brianne has competed multiple times in the National Trumpet Competition as both a soloist and an ensemble member. She is also an avid freelancer and private studio teacher within the Phoenix valley. As a certified yoga instructor, Brianne is a passionate researcher in the field of wellness for musicians. She has published multiple articles and created workshops on ways to incorporate yoga into a musician’s lifestyle in order to counteract repetitive motion injuries, battle performance anxiety, and live a healthier life. Brianne is an active clinician and performer, having presented at numerous universities and conferences around the country.